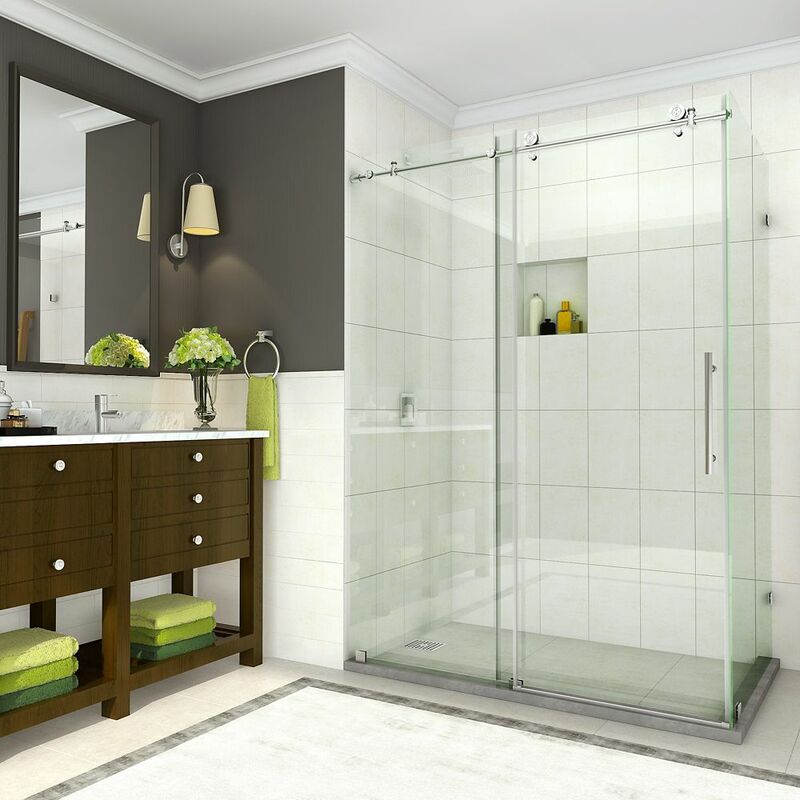 Create a functional and gorgeous showering space with the Merrick Frameless Neo-Angle Shower Enclosure. This corner model's minimalist stainless steel hardware and stunning frameless design-work will instantly create a beautiful focal point in your bathroom. The premium clear 3/8 inch tempered safety glass; tested and certified to ANSI Z97.1 Standard with StarCast by Enduroshield easy clean coating ensures your Aston enclosure stays beautiful for years to come. Featuring a 1 inch inline wall channel, this unit provides a seamless integration with out-of-plumb walls. Its hinged door is designed for left or right-hand installation to accommodate your unique application. The Merrick achieves a space-saving look that can equally adapt with any modern or traditional bathroom's dicor. Shower base not available. Images are for representation only. Once installed, glass may differ slightly than shown in image due to light absorption and reflection. Establish the spirit of the French Industrial design in your own bathroom with the beautiful Aston Vienne Corner Frameless Sliding Shower Enclosure. Comprised of premium 3/8 in. (10mm) tempered clear glass with professionally applied interior StarCast glass coating that ensures long-lasting clarity and protection from stains, the Vienne Sliding Shower Enclosure creates a striking contrast of modern craftsmanship with French design for your dedicated corner space. Its effortless gliding 2-wheel hardware, frameless aesthetic with black Blockpress mullion glass screening and matte black hardware, the Vienne will be sure to make a bold statement.